1. Visit YouTube and choose a video you want to watch > click Play and wait for the Ad to finish running. 2. Click on the Settings gear in the bottom right hand corner of the video box, and turn off AutoPlay. 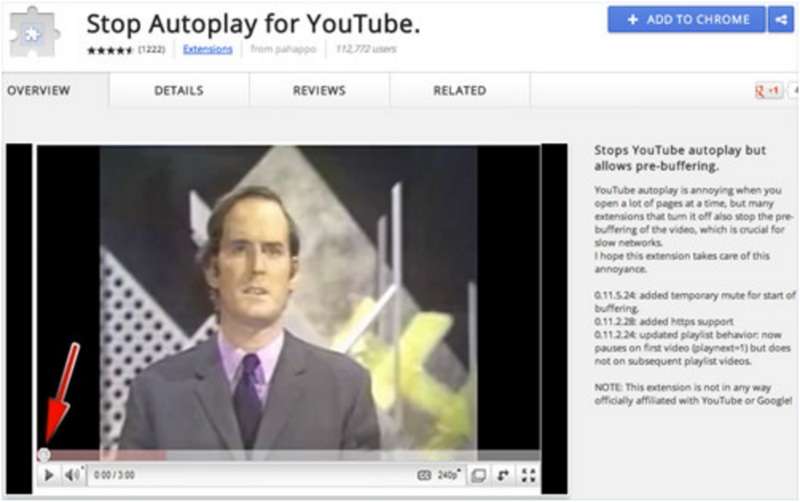 If you are using a Chrome browser, you can also add the Stop Autoplay For Youtube chrome extension. This extension prevents YouTube videos from playing once they finish buffering if you want to cue up multiple YouTube videos at once. After you visit the Chrome web store and search for Stop Autoplay for YouTube, just click Add to Chrome. That’s it! I had no idea there was a way to turn this off. Thank you!